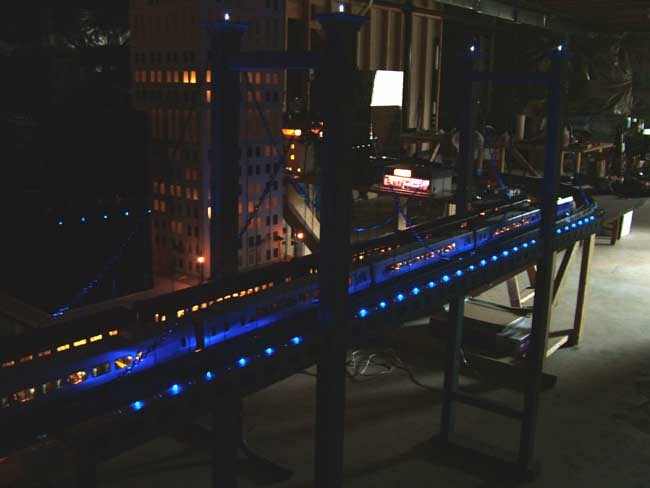 When I first built my "temporary layout" (which is now going on its 7th year), I made it out of two 4' x 8' sheets of particle board. I arranged these 8 feet apart from each other, and then connected them with two 8' long shelf boards, which I found on sale at Lowe's. This gave me a nice long stretch to run a relatively long train. 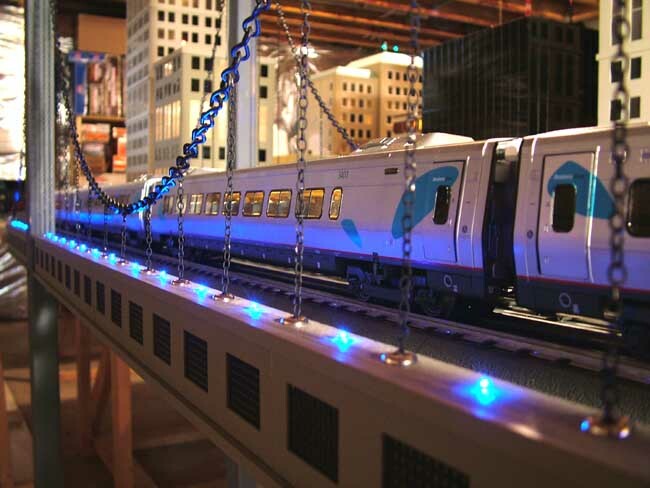 The main goal of this layout was simply to test-run and enjoy the trains I had started to accumulate. 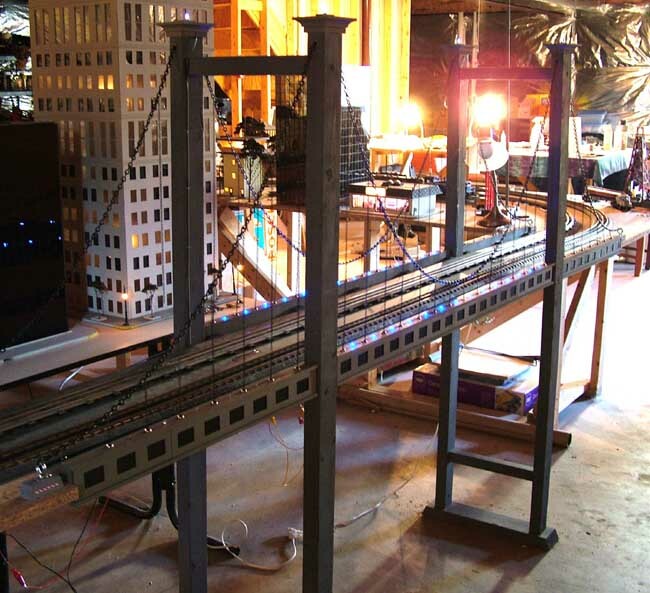 Later, I converted one of the 8' long shelves into an abstract suspension bridge. I did this by simply making two upright frames, each with two towers connected by three crossbeams. 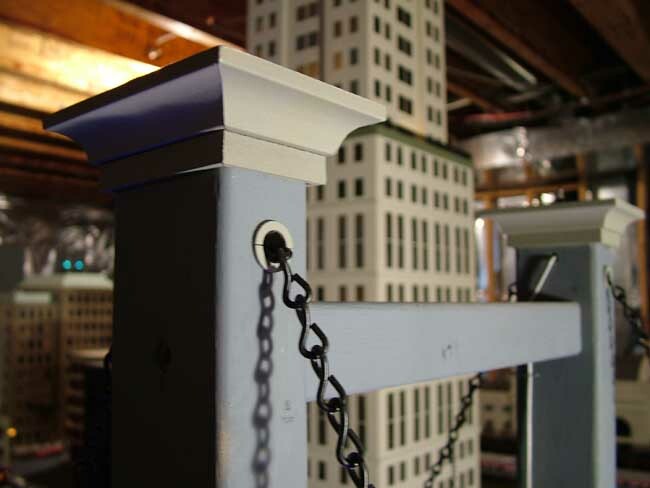 The towers are each just 2" x 3" pine studs, and the crossbeams are 1" x 1" pine studs. There is also a base for each upright frame made of 2" x 4", with angled sides. I painted the frames with gray primer spray, and dressed each tower top with some crown molding for some character. Unfortunately, I don't have many photos of the first rendition of this bridge. But it served me well for several years. 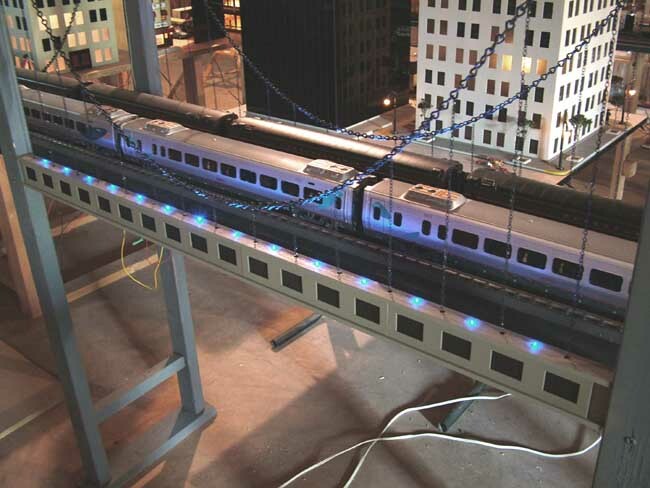 Sometime in 2006, after I had materially completed much of Union Station, I wanted to move the Union Station table into the slot that was occupied by the bridge. 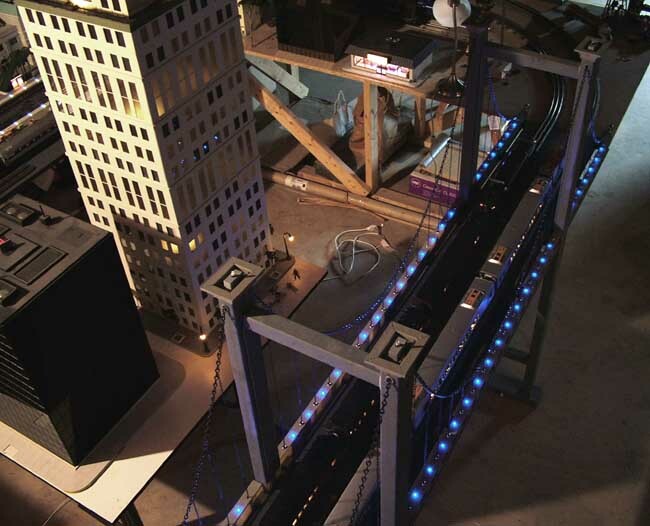 So I moved the bridge out, and placed it against a wall, and put the Union Station scene in its place. A few weeks later, I accidentally knocked the bridge over, and it suffered moderate damage. So I began a refurbishing project in mid-2007. 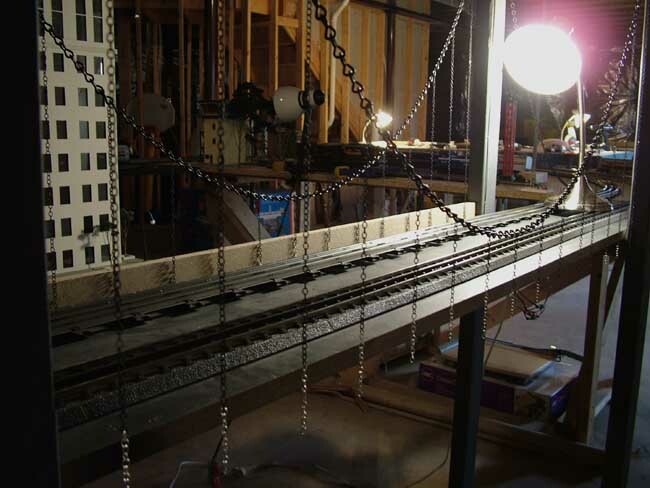 The original bridge had some black chains which I draped over the towers, to simulate the main cables of a suspension bridge. I drilled holes in the tops of each tower to run this chain through. I always imagined I could hang some kind of rope, thread, or dowel from the main chains to simulate the vertical supports. Well, I knew soldering straight metal wire or cable was beyond my skill level, and I also did not want to be in the business of tying dozens of threads to the main chain. But it did dawn on me to just continue with the chain theme. Why not? The bridge is already wildly unbelievable for a number of reasons, not the least of which being that the main cables are made of chains. So I found some smaller chain at Michael's craft store, painted it black, and then used some very fine needle-nose plyers to pry open the links in the small chain, wrap it around one of the links in the bigger draping chain, and let it hang. This is harder than it sounds. As you continue to hang more vertical chains, the weight of these hanging chains changes the shape of the curve of the draping chain. 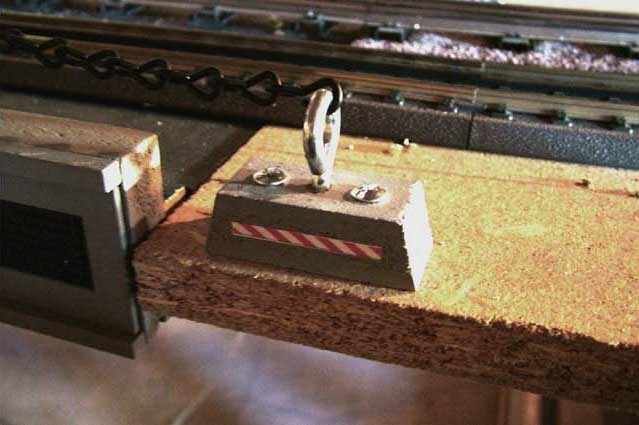 This causes the pattern of all the existing hanging chains to shift significantly. So although I had made evenly-spaced marks to hang each chain, by the time I was just a quarter of the way through, the chains I had already hung were off their marks. So basically I just had to keep going back and moving chains around until it looked reasonably good. I cut special pieces of 3/4" particle board into strips to mount onto the sides of the bridge. These "side frames" provided a place to drill holes, into which the vertical chains disappear. The chains end up looking taught, even though they are merely hanging into holes in the side frames. At the same time I was going through this process, I was also drilling holes and soldering in sockets for blue LED marker lights. I don't know why I chose blue: probably the same part of my brain that thought chains would be the best way to go for faking a suspension bridge. 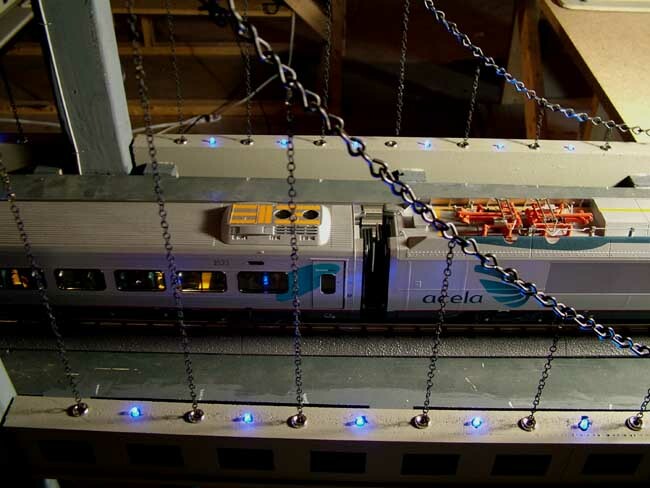 The blue LEDs are wired serially in groups of four. Each blue LED is rated for 3.5 volts, so this enables me to feed the bridge directly from the 10 volt AC fixed posts from the back of my Z4000 transformer. 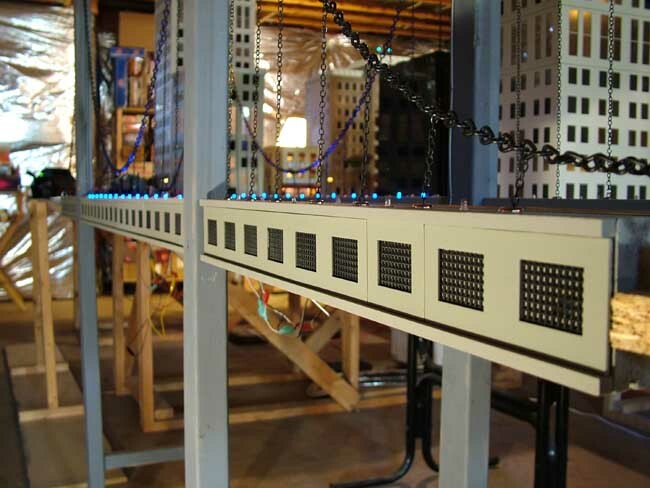 The 10 VAC immediately goes into a bridge rectifier to give the LEDs rectified AC. Each gang of 4 LEDs taps from the 10 volt rectified AC, and has a resistor in series with it to drop the glow down. Blue LEDs are quite bright when run at nominal voltage, so dropping this down a good bit with 470 ohm resistors provided the right amount of glow to my eyes. The original bridge had one red marker light on top of each tower. 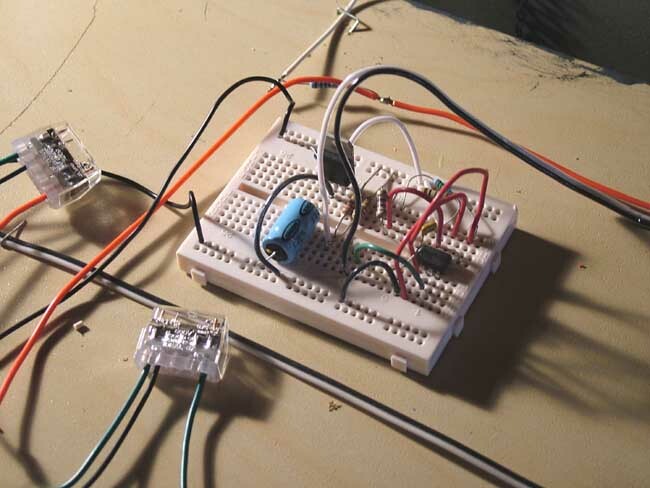 By this time, I had figured out how to use a 555 timer chip to make LEDs blink like a strobe light. So I decided to replace the red marker lights with white blinking strobes. 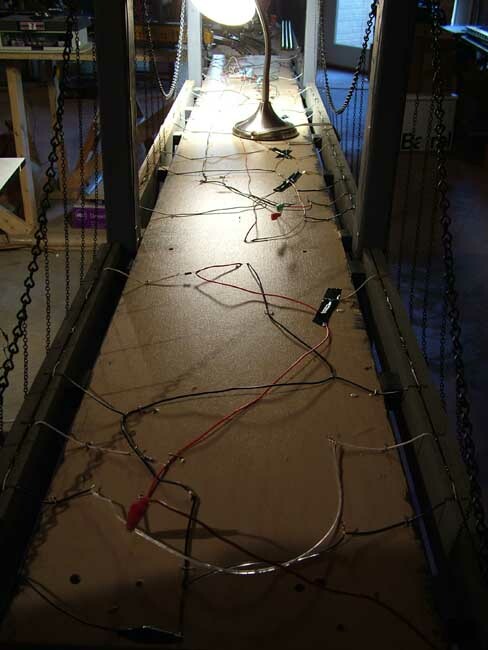 There is a small breadboard under the bridge which is fed the same 10 volts rectified AC. Using a filter capacitor and a voltage regulator, I feed a 555 timer chip 9 volts DC. The strobe signal from the 555 ends up being something like 7.2 volts, which then goes through a single resistor which feeds 4 white LEDs, one on top of each tower. The effect is really neat, and adds a nice animated touch to the bridge. It looks really interesting at night, especially when there is a lot of smoke in the room from the double-stacked Triplex steamer. The strobes light up the smoke when they flash, and the effect reminds me of how some city strobes look in San Francisco in the fog. To complete the project, I glued on 1/4" strips of square dowel on the top and bottom edge of each side frame. This provided a nice recessed channel to install some black plastic grid texture. On top of this, I placed some specially-cut strips from the West Park Tower building fronts, and this gives the bridge a little architectural character. I found some little chrome-plated grommets at Home Depot which served as nice collars for the holes that the vertical chains fall into. I used clear-drying Canopy Glue (Formula 560) to glue these on top of the side frames around the chains. In early 2008, I started playing around with using CNC lasering to engrave text onto styrene sheets. I plan to affix these placards to the horizontal crossbeams between each tower. I ended up making adjustable footings for the draping chains to anchor into, as I may need to adjust these if I end up moving the bridge. All in all, it's a neat bridge, and I suspect unique in the world of model trains, in all scales. 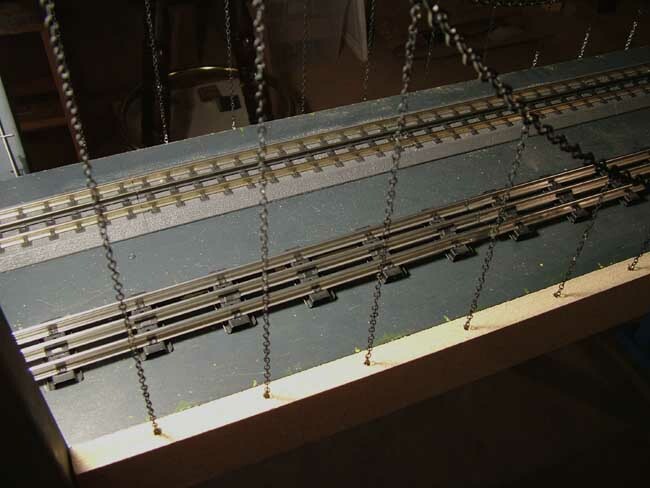 Fellow OGR Forumite "Rex Desilets" tipped me off that there is a real bridge in England that utilizes a kind of chain. 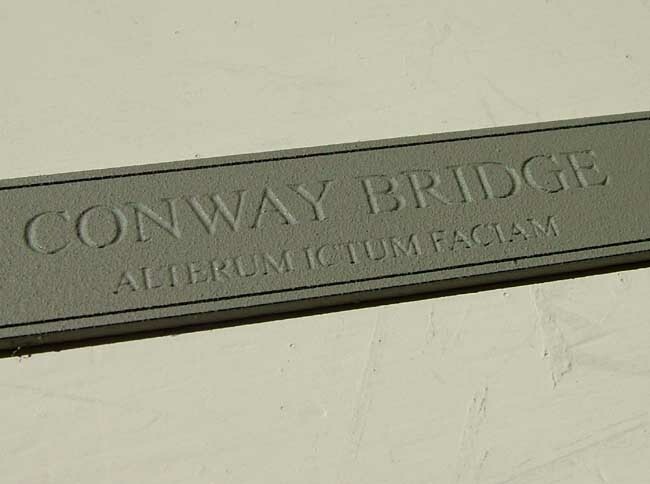 It is called Conway Bridge, and I thought it fitting to name this bridge after it. "They say there's a prototype for everything" Rex said. Who knew? Hi John...I just went through this whole blog on the bridge. I just love that uniqueness of it and the endless chain(no pun) of little ideas that make this work. 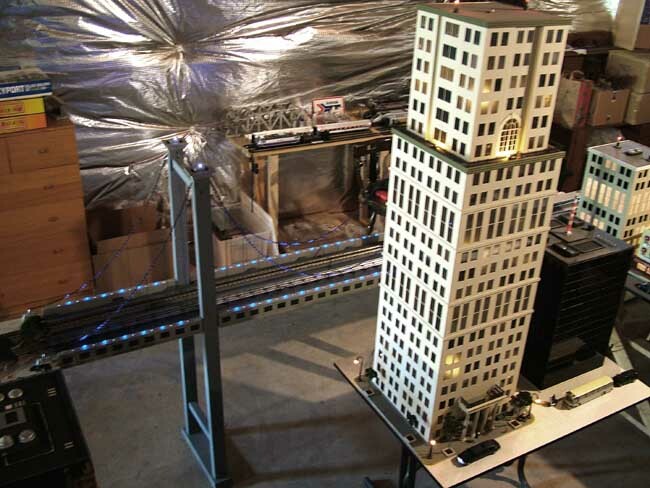 I checked this out as I'm looking at using a bunch of LED's for my buildings, etc. I'm new to J&C so I assume that your layout has made some progress since the posting of this thread in 2008! you can see my J&C pitures on the Archive-Blog page under MarkB. Thanks Mark! Yes this bridge was fun, and still operates from time to time. My own layout-building activities have ground to a halt for some time now, but I'm hopeful that I will be able to get back to it some time. Likewise John, this bridge is really neat and is very similar to an arrangement I've been considering on my own garden layout, with my own version of one of Brunelâ? ?s wonders. The chains not only look good but would cope well all year round. I feel distinctly inspired now! It is a magnificent bridge. Very nice. 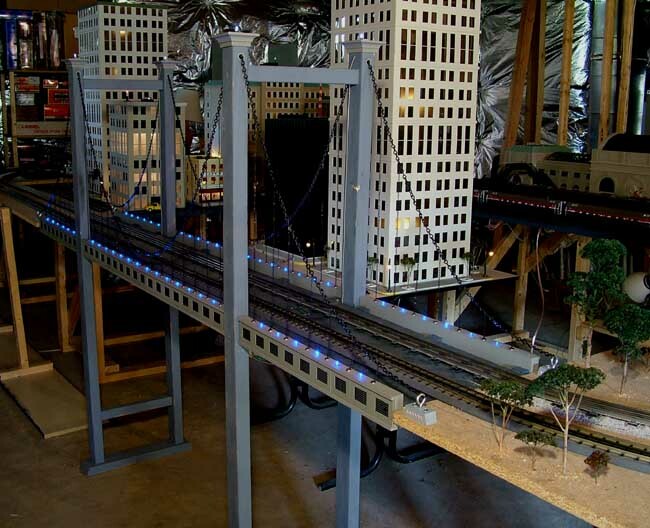 All it needs is a river underneath, with one of the Lionel operating tugboats pushing a barge. Thanks everyone! Nick, I agree about the synchronized strobes on top, which is why I went to so much trouble to wire them up. In "night" scenes, especially with the room full of smoke from the Triplex, the flashing lights in the fog just look really fun. I don't have much of a "finished" layout, so it's these individual vignettes that I enjoy.